Modnauts venturing to Downtown Tulsa can enjoy a special treat this holiday shopping season. The Tulsa Deco District Pop-Up Shops have returned for 2012 after a stellar performance last year. They have expanded the offerings- and locations. Most notably for fans of modernism this includes the little white block building on the corner of 7th and Boston. For years we've been seeing Smith Bros Abstracts in the window. But the building was actually a branch bank designed by Robert Buchner for the Ponca City Savings & Loan. It has been vacant for many years. This week we got to step inside for the very first time. Just seeing the lights on at night was a real treat. The shopkeepers inside were feeling a little ignored by all the gawkers coming in to look at the building instead of their wares. But they seemed to be taking it all in good stride. The little building is surprisingly original, and in relatively good condition. Inside you can see the original color of the Virginia Greenstone. Unfortunately the outside was covered with white paint many, many years ago. But fixtures, hardware and flooring all appear to be as Buchner prescribed them back in 1956. The most interesting feature inside has to be those Neutra-esque spider legs reaching up to the ceiling. Incidentally, the shops in this location are custom silkscreens from Flash Flood Prints and antiques from Celebrating Home. 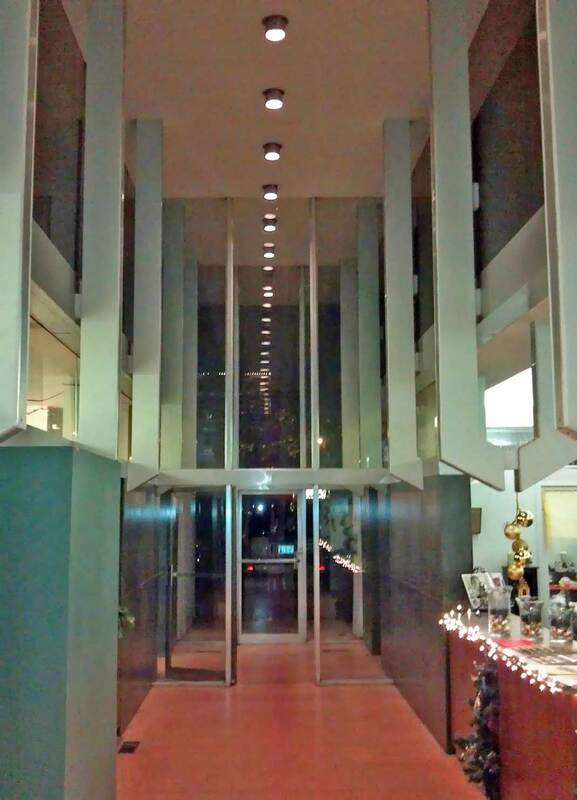 So take a trip downtown and do a little shopping, and be sure to peek inside this Tulsa jewel of Mid-Century Modern.